1. Sit in a quiet place either indoors or outdoors (very powerful sitting under a tree with back to tree trunk). 2. Take a few deep breaths to relax by inhaling through the nose and exhaling out the mouth. Begin visualizing roots going down from your feet into Mother Earth. 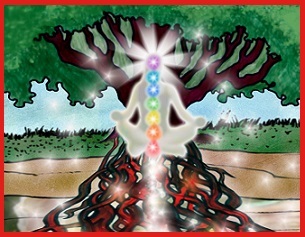 Visualize a Grounding Cord, like a large root of a tree going down from your Root Chakra deep into the core of the Earth. 3. Feel the Earth connection. Give thanks to Mother Earth, ask permission and with your intention draw pure Earth energy up through these roots and Grounding Cord circulating, flowing, cleansing, and grounding. Choose a color you see this energy being. 4. Now let any old thought patterns that do not serve you, situations you cannot control, and physical/emotional pain float down through the Grounding Cord to Earth. Sense the energies dispersing and releasing. You are relaxed and rejuvenated. Ask Mother Earth to recompose these released into something beneficial to the planet. 5. When ready take a deep breath, open your eyes. You are now grounded.